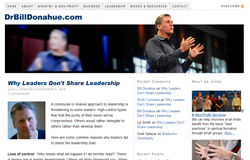 This week’s featured blog post is from Bill Donohue and it’s entitled Why Leaders Don’t Share Leadership. Dr. Bill Donahue is Founder and Lead Strategist for The Communitas Network and is a popular speaker, author and consultant to high-impact leaders and organizations. His mission is to resource catalytic leaders to build transformational groups and teams for the purpose of mobilizing missional communities. Bill’s experience in the marketplace and in non-profit environments makes him uniquely gifted to coach and equip strategic leaders for personal growth and organizational effectiveness.